By conforming to your existing terrain, Lighthoof is the only product that can lie right over your existing muddy ground. There's no need to excavate or create a compacted gravel layer underneath. You can install it on steep slopes, around trees and over roots, through shallow ditches, and on lumpy ground. Have a low spot where water wants to pool near your barn or gate? Lighthoof can also be used to create supported open drainage features within your area, a huge benefit for maintaining your surface flow. Lighthoof is easier and cheaper to install. Less intense site prep: No need to remove mud or access your area with heavy equipment — ideal for remote, tight, or large areas on your farm, or low budget installations. Much lower gravel usage: Other grid guidelines recommend 8-34" of gravel for proper installation depending on conditions. Lighthoof uses 4-6" for all conditions. DIY Friendly: Lighthoof is very easy to install and doesn't require specialized equipment or tools. If you can't or don't want to hire someone to install your Lighthoof panels, you can roll up your sleeves, grab a rake and a hammer, and get 'er done yourself! Lighthoof is safe and gentle with no brittle edges or slippery surfaces. What Makes Lighthoof "A Horse of a Different Color"
Lighthoof works differently than the grids or mats that for years were our only manufactured ground support option as horse owners. Lighthoof is made from flexible plastic strips, not hard plastic tiles. Lighthoof works by holding gravel in a network of pocket like cells which resist erosion, instability, and gravel loss due to horse activities like pawing and frolicing. The stretch panels expand to cover a larger area per solid sheet than a system of small tiles which need to be connected togetehr at all of the edges. 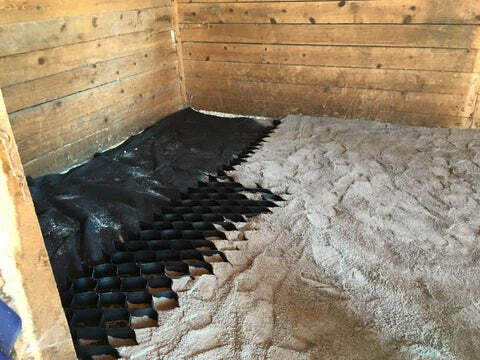 Imagine each Lighthoof panel as a mattress that sits permanently over your damaged ground to support your horse. The flexibility of the panels also make them great for creating long lasting grading and drainage features in your terrain that direct water away from your structures and hold up to years of hoof traffic without losing their shape. Lighthoof's expanding panels use about 1/3 as much plastic as the hard grids, making it lightweight and safe while also being better for the environment. That's right, hard plastic grids contain approximately three times more plastic than Lighthoof for the same coverage area! Three times more plastic means three times the weight for shipping and three times the environmental impact. Lighthoof weighs less than half a pound per square foot of coverage and ships / stores collapsed at 3% of its expanded size, saving materials and saving you money! There's great peace of mind to knowing that your horse has a safe and comfortable place to be outside, even in bad weather. Safer than concrete, it also offers better drainage and traction, making it an excellent alternative for stall and barn aisleway bases, pathways, drives, or gateways where you need firmness without slickness. Lighthoof's flexible textured panels can't poke up out of the ground with a hard or sharp edge to injure your horse. If the tops of panels become visible, the gentle cell walls simply bend over under the horse's weight without cutting him, preventing the panel from becoming more exposed. In the same situation, leverage can cause a hard plastic tile to lift further out of the footing, exposing a slippery surface or sharp edge. Uneven ground due to mud, or deep unstable footing like pea gravel, can keep the horse from standing with natural angles in their joints. This can lead to soft tissue and joint strain from standing and catastrophic injury when moving quickly on a non-supportive surface. Wet or frozen mud can be tamed by Lighthoof into a smooth and comfortable surface, eliminating painful hoof bruising or infection. Softer surfaces for sensitive feet are easy to achieve with a thin layer of sand or bark footing on top of the supported Lighthoof base. Like tree roots, Lighthoof provides support to prevent erosion and unhealthy runoff or soil conditions. Because Lighthoof stops muddy paddock areas from interfering with the proper filtering of groundwater and prevents damage to sub-base, it actually reduces the impact of horses and livestock on the existing ground. In addition, because it's semi-permeable, rainwater can slowly filter through it into the soil without erosion, and it prevents manure and silt runoff from contaminating bodies of water. Use of Lighthoof "sacrifice area" in winter keeps your pasture healthy and grassy, which fights erosion, dust, and habitat destruction on your land. Lighthoof provides a solid base for your horse's paddock footing to stop mud in its tracks, even helping protect tree roots if you have them in your sacrifice area. PRO TIP: Do you know your local Do you know your local conservation district? Conservation districts are non-regulatory agencies that provide free planning, technical assistance, and even cost-sharing to help small farms become more environmentally friendly. Inquire at your county's conservation district to learn about programs in your area. Lighthoof is made of a flexible High-Density Polyethylene, a chemically inert and harmless material that won't break down in the soil or leach chemicals into your groundwater. As part of a comprehensive pasture management strategy, Lighthoof helps you create a healthy environment for you and your horses to live and makes the world a better place.